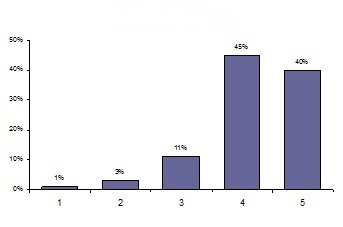 Measuring satisfaction with a rating scale virtually always creates a very distinctively skewed curve, such as the one below, where approximately 85% of the responses are split between the top-two responses (4 and 5), and the remaining 15% trail off to the bottom end of the scale. This is what I like to call “The Shape of Satisfaction.” The distribution illustrated below yields an average rating of 4.2. Typically, in satisfaction measurement, we see average ratings in the 4.2 to 4.3 range. 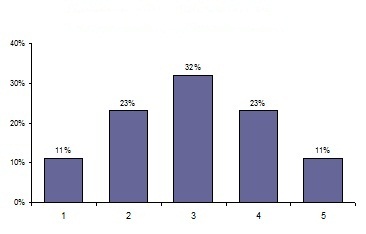 As a point of comparison to other providers, if we were to ask the same respondents to compare their satisfaction with the company to that of other providers with which they do business, we would typically get a normal distribution similar to the following – where an equal number of respondents say their satisfaction is higher or lower compared to other companies they do business with. Therefore, a typical satisfaction rating in the 4.2 to 4.3 range is normal and does not necessarily represent a source of competitive differentiation. Furthermore, when satisfaction data is compared to customer loyalty data, research has observed for a five-point scale similar to the one to the left, customers who assign a rating of “4” are approximately 60% less loyal than customers who assign a rating of “5”. Various theories attempt to explain the phenomenon of the skewed satisfaction curve. Of these, I believe the most logical and intuitive explanation is a self-selection process. First, being a customer is a self-selective process where dissatisfied customers are more likely to leave the company. Second, companies generally satisfy their customers, because if they are not competitive in terms of satisfaction, they would be destroyed by customer attrition and cease to exist. What are the implications of the shape of satisfaction? First, there are significant implications for the interpretation of customer satisfaction data. Simply having an average rating of 4.2 on a five-point scale does not necessarily denote strength. Rather, managers should understand a comparative advantage does not necessarily exist until the average on such a scale exceeds 4.3. It is important to understand how your customer satisfaction compares to your competitors. One way to collect such a comparative context is to ask customers to compare your service to that of your competitors. This is much less likely to be skewed as the satisfaction curve, and will determine if your satisfaction is strong relative to your competitors. The second implication is the importance of measuring loyalty rather than satisfaction only. Loyalty can be measured via a number of means: likelihood of referral, NetPromoter, primary provider, etc. Third, it is important to focus on the other extreme low end of the satisfaction curve. Drill into the 15% of customers who are not satisfied, and attempt to adjust your product and service mix to shift even just a few customers up the satisfaction curve. Even slight improvements in shifting these customers up the curve will have significant improvements in customer loyalty and profitability. Again, each point increase on a five-point scale increases customer loyalty by 1.7 times, and depending on the industry, a 5% increase in loyalty equates to 25% to 85% increase in profitability.